NEWS this week that Bob Dylan is to release a drawer-emptying 138 track compilation of music from his Basement Tapes sessions brings me back. Specifically to a damp room of a shared house on Dublin’s north side, sometime back in the mid-90s, and my first encounter with some of this material. At the time I was a university student and, having plenty of time on my hands, spent a great deal of it strumming my battered Hohner acoustic guitar. Most of the songs I played were either written by Dylan or connected to him in some tangential way: Hank Williams, The Band, Woody Guthrie, The Grateful Dead. I’d picked my way through most of Dylan’s 1960s’ albums when, idling one afternoon in the since-departed Freebird Records on Eden Quay, I spotted the two-cassette The Basement Tapes. A couple of hours later I was back in my room in Fairview, about to press play on a recording I’d read of in dispatches but knew little about. What came from the speakers, from the first track (the aptly-named Odds and Ends), was nothing like the firebrand protest singer or the drug mystic of Times They Are A-Changin’ or Blonde on Blonde. 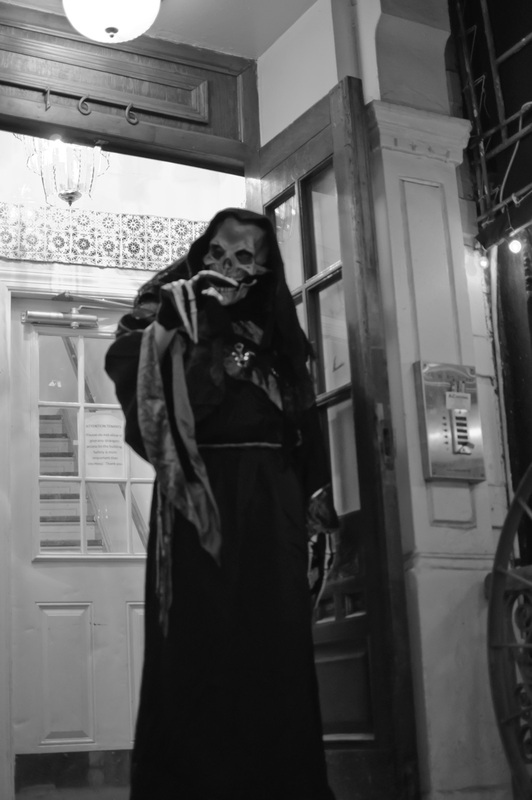 This was a different beast to those recordings, a sprawling circus in a swamp, populated with history-book figures, hustlers, blues singers, welcoming women and doomed men. Some songs covered a 200-year sweep of America history, some the hassle of placing a long-distance phone call. It was wider and deeper than any single set of songs I’d heard before. Woody Guthrie had travelled and written America but songs like Clothes Line Saga – while quotidian on the surface – cut much deeper into the fabric of the country. Slave songs sat beside surreal travelogues, hymns to personal freedom were followed by the Edward Lear-esque nonsense verse. The critic Greil Marcus has pointed out that the Basement Tapes represent less an album or a genre than a country and it’s history – “the old, weird America”, another country whose story was distilled by six men in a home studio in 1967. I’ve been playing, thinking over and reading about that country and these songs since I pressed play in that room almost 20 years ago. Over the years I’ve heard other outtakes from the sessions – in addition to the 22 songs, 16 by Dylan and eight of The Band’s, on the official release – but I’ve never heard the bulk of the recordings. 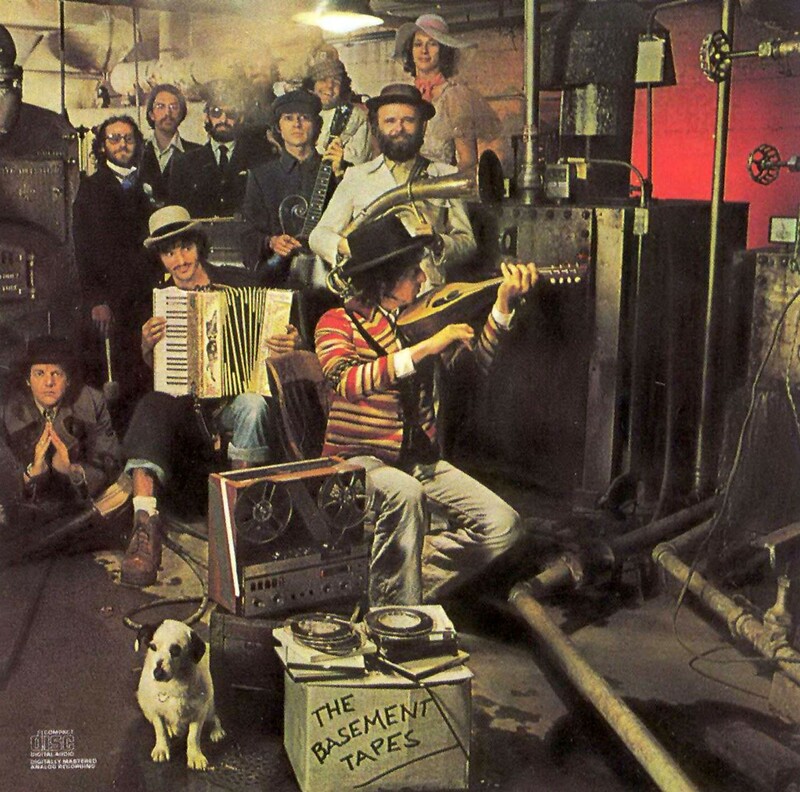 Is it naïve to expect that The Basement Tapes Complete could provide something similar for those who listen now, in a another time and a different country? The Beatles have always been a part of my life. Like rain. Or the sun. Or the colour yellow. I devote little attention to the music. It’s just there, in the background, always three skips away, or on some Sky Arts documentary. Like most people under 50 I’ve no recollection of the first time I heard one of their songs. It was likely my mother humming Love Me Do when I was still in the womb. The band itself was long defunct by my 1980s childhood, of course. Despite this, the first cassette I ever stuck in my Walkman, as a kid flitting down Athlone’s Ballymahon Road, was a Beatles’ best of. The years passed and the songs would pop up or creep in here and there. As a teenager I learned basic guitar chords in order to play Fool On The Hill. I have vague recollections of nights in bars in San Francisco’s Mission district, where a pal and I would load the jukebox with dollars to play Abbey Road end-to-end. Fifteen years after that I was back to playing Beatles’ tunes, this time back on guitar at my sister’s wedding. But in recent years the music slipped out of reach. I drifted away, wandering the outer reaches of Eno’s Ambient series, or trying to follow Monk solos. Last May I came close to seeing a Paul McCartney show in Japan. Circumstances conspired to prevent that from happening and afterwards I meandered on, with a vague, guilty notion that I really needed to listen to more of his solo albums, or go back to The Beatles. But I didn’t. Until last week. Sifting through the racks at a Dublin record store I came across a copy of Let It Be. It occurred to me that – despite knowing the melody of almost every tune on it – I’d never actually owned a copy of it. That night I put it on, listened to the opening track Two Of Us and, for the first time in a long time, I heard, really heard, the greatness again. Two Of Us is The Beatles. Written by McCartney, it lacks some of the Lennon bite. But this is balanced on the album, as it follows a skittish vocal outtake of Lennonesque nonsense. 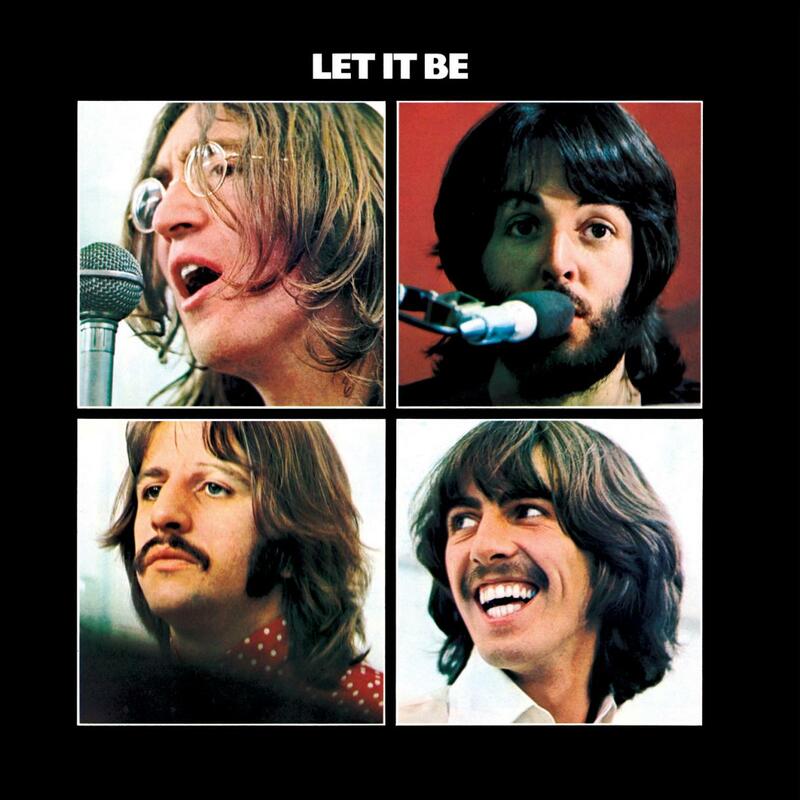 The song has all the classic Beatles’ element. 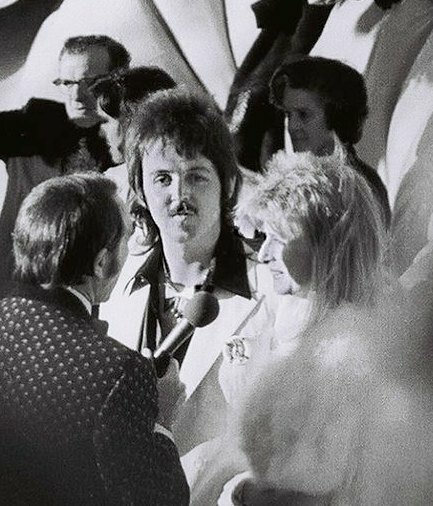 It’s lyrics are a brotherly you-and-me-against-the-world, the you and me McCartney and Lennon (as Ian McDonald surmised*) – despite the former’s claim that the song was written about Linda Eastman. The pair’s Everly Brothers-style vocal harmony harks back to their early days playing together in Liverpool. It’s impossible not to tap your foot to the rhythm, or hum the descending C to A of “hard-earned pay”. It’s not all swiftness and light though. The song’s brightness is subverted in its six-bar middle section, as McCartney shifts to a melancholy B flat. This is resolved as we move into the verse again, but the closing lyrics point to divergent paths ahead: “Two of us wearing raincoats, standing solo, in the sun”. Recorded at a fractious time, as their group began to fall apart and amidst tension between Lennon and McCartney, Two Of Us is, in three and a half minutes, all that made The Beatles great. 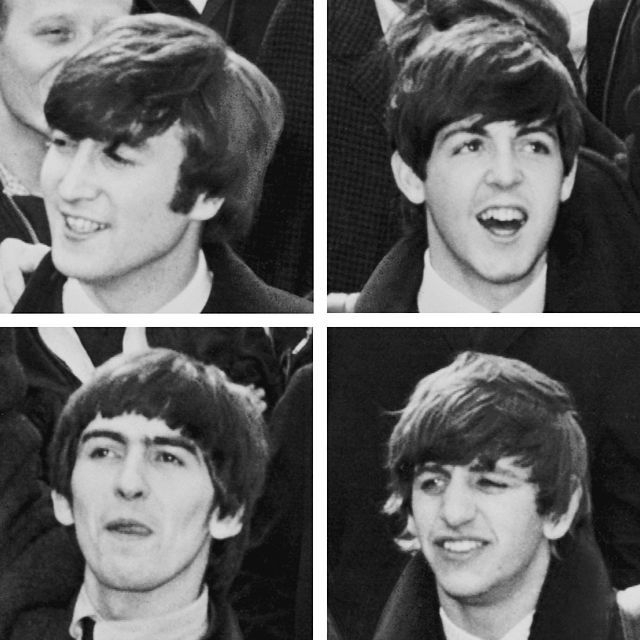 It’s why some Beatles’ songs are close to pop perfection. And it’s why I should listen to them more often. There was no town, nothing but the rails and the burned-over country. 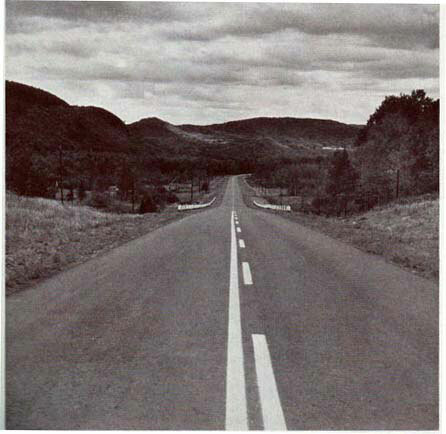 The thirteen saloons that had lined the one street of Seney had not left a trace. The foundations of the Mansion House hotel stuck up above the ground. The stone was chipped and split by the fire. It was all that was left of the town of Seney. Even the surface had been burned off the ground. Six years after the First World War Ernest Hemingway wrote his short story Big Two-Hearted River. In 1918, on his first day posted in the village of Fossalta in northern Italy as an ambulance driver, the 19-year-old Hemingway found himself combing a field for body parts, following a munitions factory explosion. Days later he was seriously injured when a mortar shell exploded close to him. He was hospitalised for six months in Milan and left Italy on his discharge in early 1919. 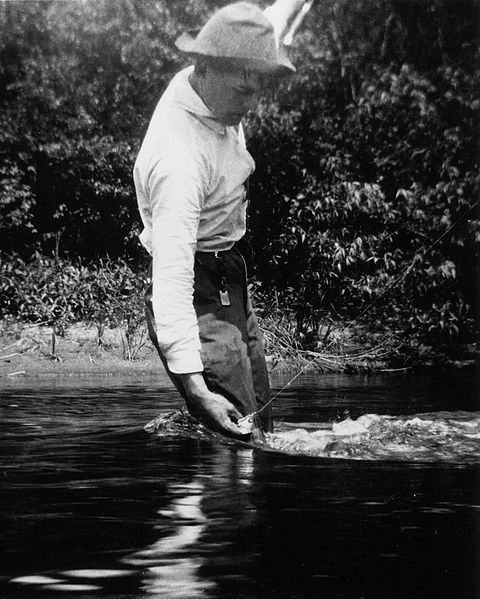 Ernest Hemingway fishing at Walloon Lake, Michigan, 1916. What he witnessed in his brief time in northern Italy provides a context to a number of the writer’s early works. It’s perhaps most explicit in Big-Two Hearted River, written in 1925. The story documents a hunting trip in Northern Michigan, undertaken by newly-discharged narrator Nick Adams. It is is read as a parable for the rejuvenating powers of nature, as Nick leaves the burnt-out town of Seney behind to hike and hunt into the uplands, to locate a place where “nothing could touch him”. It also introduces a trope that would recur in Hemingway’s later writing: the juxtaposition of mountain against the plain, one representing purity, healing and principle, the other baseness, danger or corruption. Last Sunday my wife and I left the city and travelled to Howth, a coastal village 15km north of Dublin’s centre. It had been a long time since we’d hiked. Weeks of the day-to-day had led us both to simultaneously suggest the trip. Leaving behind the crowds of visiting students, strolling families and traffic we hiked out and above the village to a coastal trail which winds along the cliffs overlooking the Irish Sea. An hour in, walking the cliff path, we turned a corner and hiked into Nick Adams’ Seney. 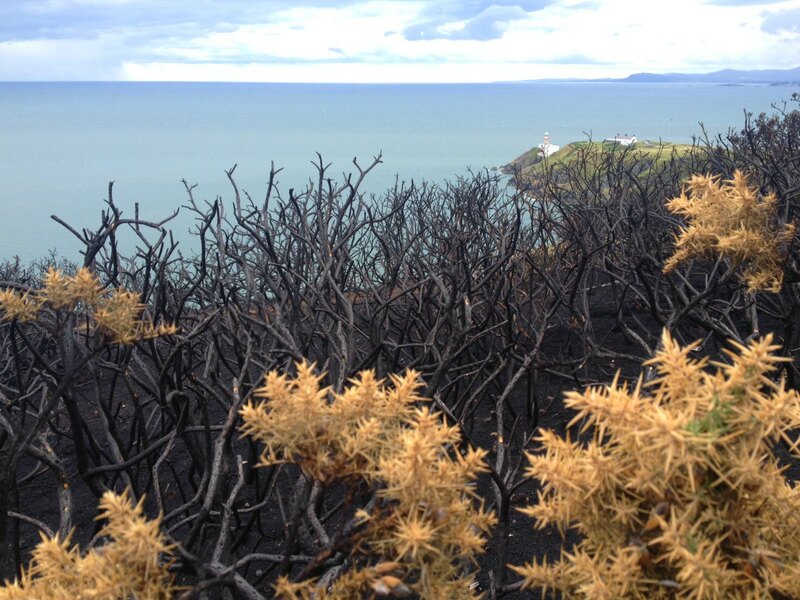 The hillside all around was scorched and blackened and the sea air smelt liked cinders. 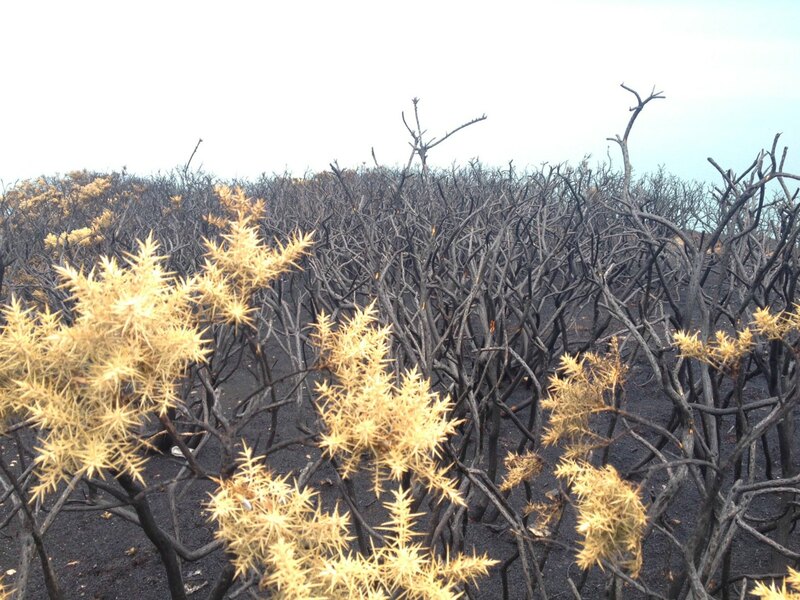 Days or weeks earlier a fire had been set, burning the grass under the gorse off the ground and much of the gorse itself, with the exception of some golden leaves above the fire line. All that remained below were burned-up beer cans and glass, and an expanse of dusty black earth. We walked on, up and out through the desolation to where we turned and there, from a height and in the distance and the clearing air, was the sight of Dublin Bay and the Baily Lighthouse. We had reached our destination, a hillside washed green by recent rains. The sun shone on the water, the Dublin mountains framed the bay, nothing could touch us. Two hundred yards down the hillside the fire line stopped. Then it was sweet fern, growing ankle high, to walk through, and clumps of jack pines; a long undulating country with frequent rises and descents, sandy underfoot and the country alive again. ‘Nothing could touch us.’ Dublin Bay and the Baily Lighthouse. 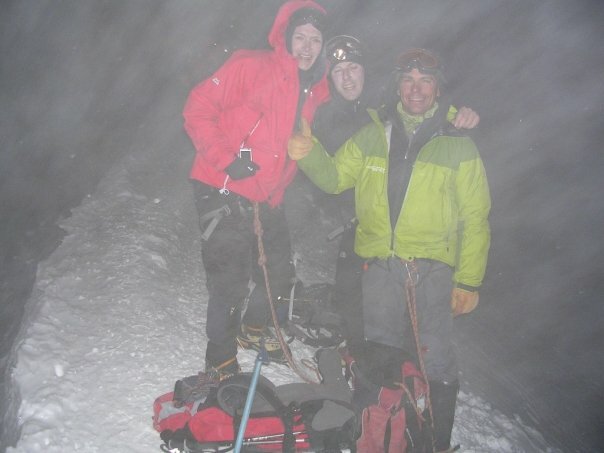 On the summit of Mont Blanc, 22 August 2008, with Eamon Costello (left) and guide Ludo. SITTING in the departures lounge at Geneva International Airport I had little sense of feeling lucky. I felt sore. My toe was busted up and my legs ached. I was happy though. 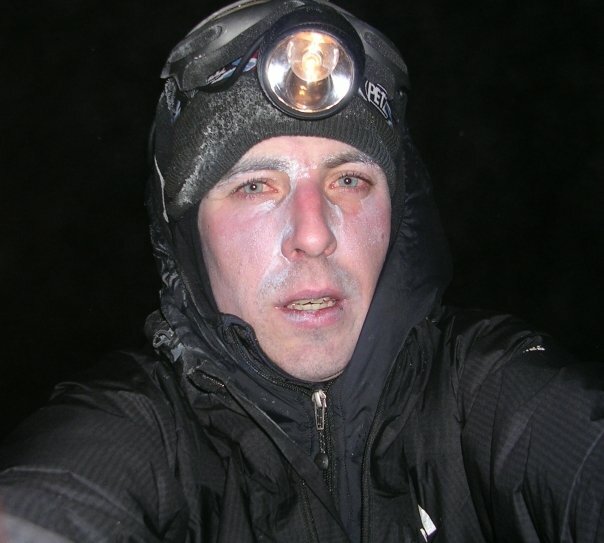 It was Sunday, August 24, 2008 and I had summitted Mont Blanc, the highest mountain in western Europe, 48 hours earlier. Then I got the message. The text came from a work colleague back in Dublin, himself a climber, who knew I was pushing for the summit that weekend (just not exactly when). More messages followed in the coming hours as the full scale of one of the worst accidents in the French Alps in decades began to emerge. The climbers, five Austrian and three Swiss, were swept to their deaths when a huge ice serac broke off, avalanching down the mountain and burying them underneath. Seven other were injured. 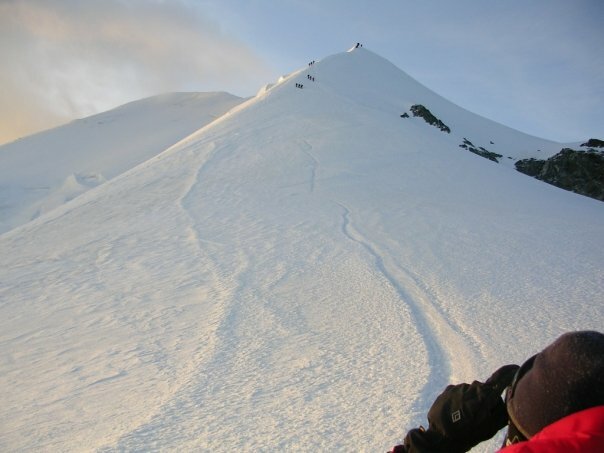 The final ridge to the summit. Eyewitnesses told of a huge tract of ice, 200m long and 50 wide, sweeping silently and rapidly down the mountain face at 3,600m, and climbers’ desperate attempts to get out of its path in time. The recovery mission was later suspended; the local mountain rescue chief said there was little chance of recovering the bodies. The French interior minister described the serac fall as “monumental” and “inescapable”. All this unfolded on the same peak where I stood a little over a day earlier. Reading the reports over coffee in a sunny airport cafe I had a sense of ‘there but for fortune’. But I was aware, as most who undertake any Alpine climb are, that accidents happen on Mont Blanc like they do anywhere else. It’s just that when they happen on Mont Blanc they tend to be far deadlier. Despite the thousands who attempt it each year ascending the peak is not safe. 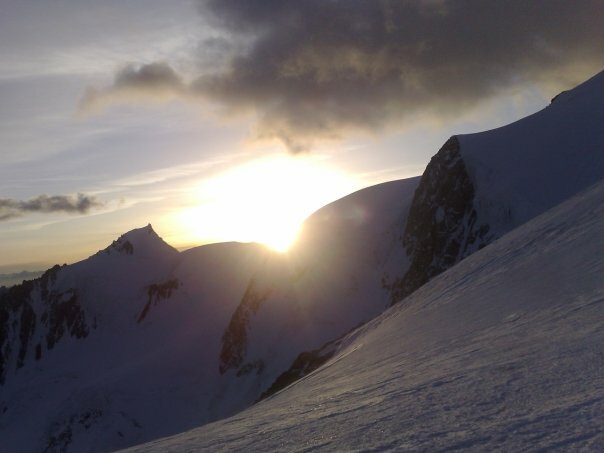 There are areas of the mountain, such as the notorious rockfall run of the Grand Couloir, that remain very dangerous – despite every precaution. The mountain – and the risks borne in climbing on it – was back in the headlines this week. On the summit, 22 August, 2008. An accident on the Dent du Geant, a sub-peak on the Mont Blanc massif, claimed the lives of two Irish climbers last Sunday. The two were experienced climbers and, by all accounts, were operating well within their comfort zone. Nonetheless a single event – which appears to have been a rope breaking loose from the face – caused the pair to fall 200m to their deaths. Many people are troubled by the apparent meaningless of such a tragedy. Every such catastrophe leads to loss of life and devastation for families left behind. People ask ‘for what’? Nothing tangible, it would appear. No great advance, no ground-breaking progression. The significance rarely stretches beyond whoever’s on your rope. The Irish climbers surely knew this, as do the hundreds of others on Mont Blanc today. That’s because at its core, and despite the necessity of teamwork, mountaineering is a solipsistic pursuit. The camaraderie is enjoyable but for many a successful ascent is, firstly, a personal achievement. That achievement comes at the cost of personal risk and most who climb seriously, on Mont Blanc or anywhere else, will accept this. The gains – chief among them watching the dawn break from the highest point on the continent – completely outweigh the risks. 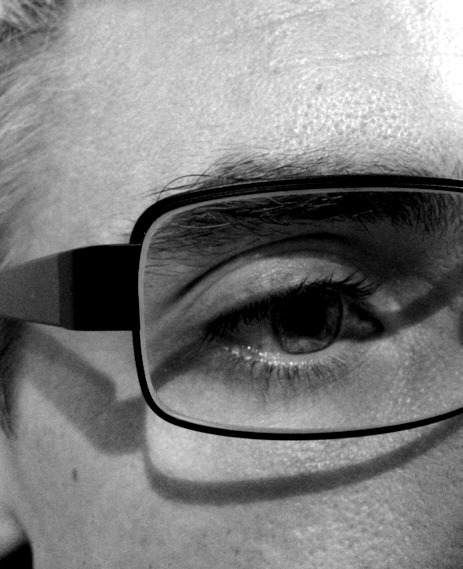 The danger is traded for the feeling and the memory – a bargain forgotten once you step off the mountain. But all that didn’t stop me sensing an echo of that Geneva Airport feeling as news of this week’s tragedy broke. ‘Watching the dawn break from the highest point on the Continent. Mont Blanc, August 22, 2008.